At LifeThyme CrossFit we believe kids can do anything! We set goals and teach teamwork and technique in a fun, safe setting. Our goal is to help kids develop a lifelong love of fitness. 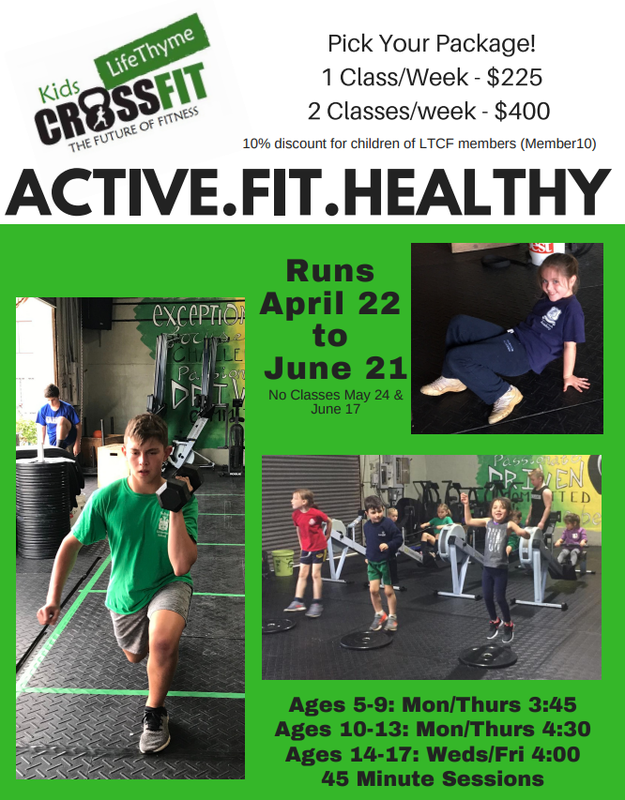 The LifeThyme CrossFit Kids program works with children from 5 through to 16 years of age to introduce and develop physical skills in a group setting focused on fun and safety that will benefit them for a lifetime. Under the watchful eye of Certified CrossFit Kids Trainer Henry Adderley, participants will build correct movement patterns in fundamental human movements. Based on the principle of Mechanics, Consistency and then Intensity, CrossFit Kids emphasizes good movement throughout childhood and adolescence. Consistently good mechanics translates to physical literacy, enhanced sports performance and fewer sports injuries for kids. Not only that, a vast body of research indicates that exercise is beneficial to cognitive function, which means consistent adherence to the program can have a positive impact on children’s academic achievement.